Thank you for your recent letter proposing changes to our anti-piracy operations in the Horn of Africa. Though we have been involved with protecting merchant vessels in this part of the world for several years, we never considered hiring sentient marine mammals to puncture pirate rafts with their horns. We are always looking for new ways to fight pirates on the high seas and using a saltwater creature with a big horn on her head seems as good a way as any. If you still want to be a mercenary and your concurrent CIA application does not pan out and you haven’t been kidnapped by some evil organization, please call me so we can arrange an interview and background check. Oh Nina Jr. will be mad to have missed out on this opportunity! I’m glad they skipped the initial beating. EEEE! 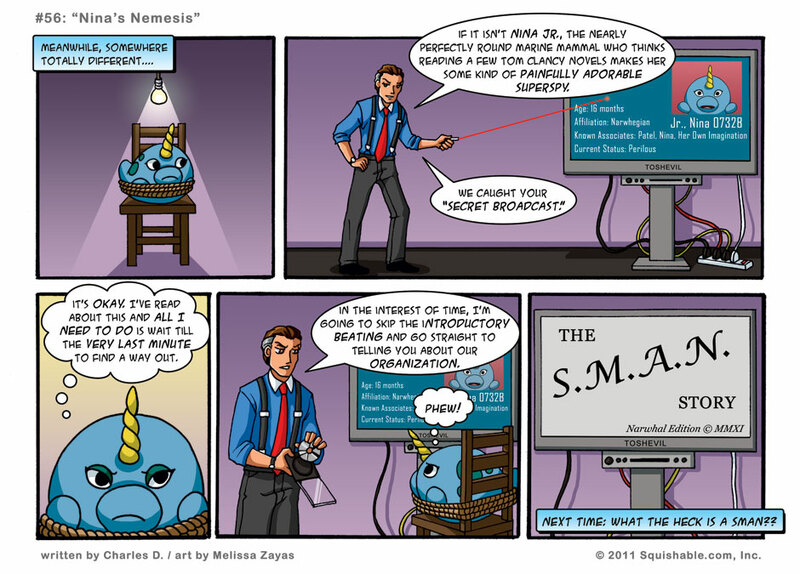 Poor Narwhals. Everyone thinks they’re mythical. Uh-oh, Nina Jr.’s been kidnapped by Patrick Bateman! Don’t get fed to an ATM, Nina Jr.! i don’t get it though. why just Nina? Do they think that Nina is the ONLY talking squishable? How can you beat a stuffy? They don’t have any organs or bones to get hurt, right? Wait, do all Squishables talk? Does the Fuzzy Five have certain powers, though? I think that all Squishables talk (in the Fuzzy Five, maybe) because remember Tech Support Tiger that helped Breakfast and Claire? all 4 of mine talk behind my back. I think my 7 do when I’m not home. I hope they want other Squishables to talk to, and they say nice things about me! omg omg that affiliation is soooo cuteee! like Norwegian! im Norwegian and i L-O-V-E it!